These are great treats if you don’t have alot of time. They can also be added to the start or end of a longer treatment. There are 10 mini treatments to choose from, please feel free to mix ‘n’ match and create your own treatment package. View the range of mini treatments. The Decleor facial treatments provide an expert response to the needs of every skin type. Even the most demanding skin is satisfied. Every Aroma Expert treatment offers a concentrate of highly targeted pure Essential Oils and Plant Extracts. 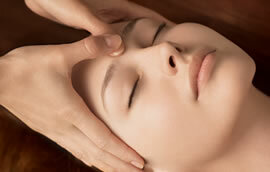 View the range of facial treatments. Thai manicure and pedicure is a fusion of Far Eastern techniques and philosophies inspired by eastern traditions and rituals. A range of contrasting sensations, warmth and textures. The uplifting aroma of tangerine mingles with the warming undertones of ginger and sandalwood. These luxury products will leave your hands and feet feeling fresh, invigorated and revitalised. View the range of nail treatments. IPL Laser, Electroysis and waxing treaments at De Beautique. Each individual hair is treated by inserting a tiny surgical probe into the hair follicle, with this in place, a tiny impulse of energy is transmitted down the hair root. The hair is then taken out, but not pulled. This is repeated over the entire area until it is cleared of unwanted hair. View the range of hair removal treatments. The famous St Tropez tan in the easy, quick drying and effective spray version. You need to come for your treatment, with no make-up, body creams or deodorant on, and your also need to exfoliate your whole body prior to the treatment. Why not add a professional exfoliation to your treatment ?. View the range of St Tropez treatments. Our range of UVB sunbeds and spray lotions work towards producing an authentic looking tan by the safest means possible. Experience the ultimate all year round tan using the Alisun V stand up sunbed. 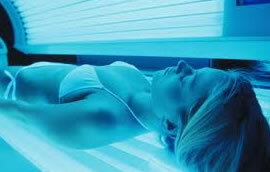 View the range of tanning & sunbed treatments. Why not treat your family member, friend or loved one ? The De Beautique Gift Voucher can be purchased for a value or treatment – allowing the recipient to create their own treatment package. For no additional cost any Treatment Package gift voucher can be supplied in a gift wrapped box. View the range of treatment packages.